For many people, there was a golden age when Britain was truly British, populated by the British, with shared cultural and religious values. This golden age is variously identified as that of King Arthur, or Elizabeth I or Victoria, or Churchill, among others. As is the case with most golden ages, all too often the evidence fails to support the myth. In the early nineteenth century, for example, the number of Germans in London was considerable (28,644out of a total population of 2.8 million, as recorded in the census of 1861, the first in which Londoners’ country of origin was sought) – but how diverse was the capital generally? This was a question explored by students at the University of Hertfordshire, and Adam Crymble, senior lecturer at that university, here discusses two illustrations taken from their findings. 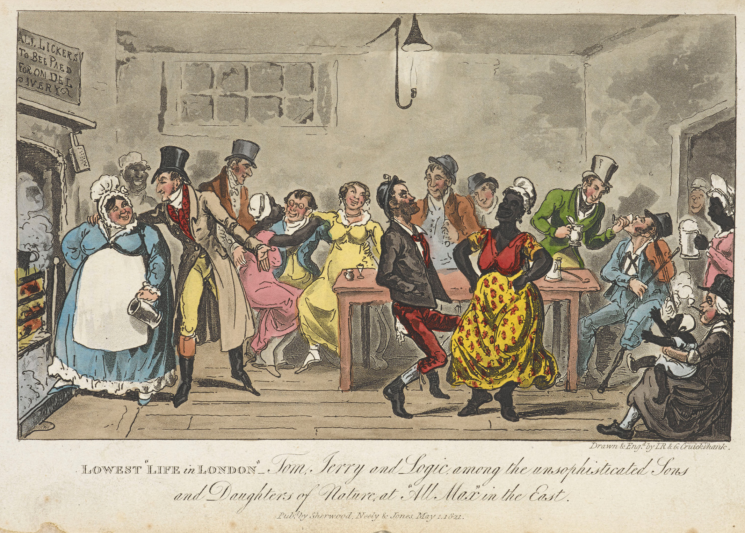 Final year history students at the University of Hertfordshire went looking for images of London’s diversity in the eighteenth and nineteenth centuries, and had no trouble finding a veritable treasure trove. The images were brought together from already-digitised collections and shared via an Instagram feed that showcases not only Britain’s diversity but also some of the challenges and attitudes faced by migrant groups over the centuries. The project asked students to consider what migration meant to the UK two hundred years ago. It proved a fabulous complement to the ‘What does migration mean in the UK today?’ poster project by our colleagues down the corridor, which is still on display at the Migration Museum. It can be easy to forget about London’s long history with migration. The dominant narrative is that migration to the UK began in earnest in 1948, when the HMT Empire Windrush landed on British shores, discharging hundreds of Caribbean migrants and kicking off a wave of post-war immigration. But a quick trip into the digital archive of Scotch–London cartoonists George and Isaac Robert Cruickshank show that a diverse London stretches much deeper into the past. 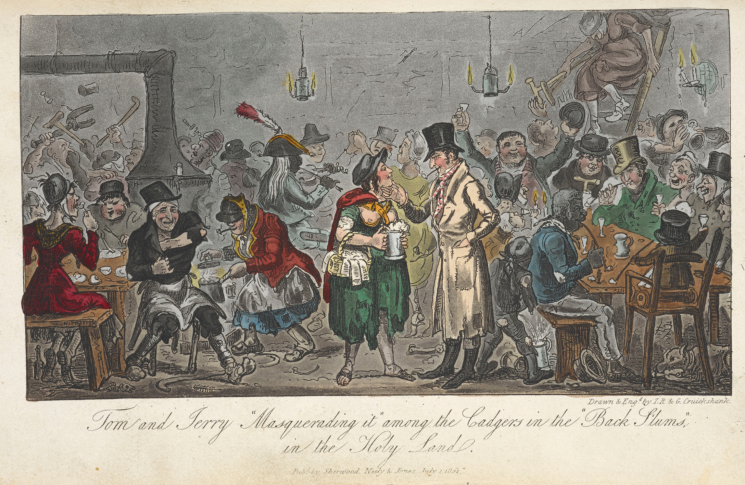 ‘Tom and Jerry “Masquerading it” among the Cadgers in the “Back Slums” in the Holy Land’ (1821), drawn and engraved by Isaac Robert Cruikshank and George Cruikshank (Public Domain, from the British Library collection). During the course of their studies, students found two images from the Cruickshanks’ ‘Tom and Jerry’ series that are particularly illustrative of that fact. In 1821, the fictional English gentlemen Tom and Jerry, on their romp about town, delved into London’s most Irish space: the neighbourhood known as the Rookery of St Giles-in-the-Fields in the west end. Today it is but a stone’s throw from Tottenham Court Station and the site of Google’s London offices. Two hundred years ago, however, it was a tangle of streets and a slum that many people feared to enter. Sometimes it was referred to as the ‘Holy Land’ – a tongue-in-cheek reference to the high concentration of Irish Catholics in the region and the ironically unholy behaviour to be found therein. It was described as a ‘rabbit warren’ of narrow passages and dangerously overcrowded houses where tenants rented a shared bed or a space on the bare floorboards for as little as 1p a night. It was among these ‘cadgers’ that Tom and Jerry spent their evening in St Giles, in one of the area’s infamous subterranean public houses. The pair witnessed the locals in their evening revelry after a hard day of begging and stealing, followed by a night of hard drinking, singing, and fighting away their daily take. The poor people of St Giles lived for the moment. With no way to safely store valuables, they knew that a day that ended penniless was a night safe from robbery. Tom and Jerry undoubtedly heard a few Irish brogues as they worked the room that fictional night two centuries ago. But the Cruikshanks’ depiction of the scene reminds us of something else: this was a diverse and cosmopolitan space. Most of that diversity is invisible to us, but there are at least three black individuals in the painting who act as a clear reminder that London was home to many different migrant groups. Two of those black people are dressed as sailors, highlighting the important role played by international trade in bringing people to London from around the world. The arrival of those particular individuals was of course linked at least tangentially to the British trade in Africans, which had ceased only in 1807, when the slave trade was finally abolished in the British Empire. But dark-skinned faces from other parts of the world could also be found on London’s streets – ‘Lascar’ sailors from India, and East Asians arriving on the ships from China were part of daily life in London. What’s particularly noticeable about the black individuals in the image is that they are simply part of the evening festivities. One of them is joining a fistfight in the back left, another plays the fiddle at centre, and the third is smoking a pipe around a table of fast friends at right. Apart from the fistfight, which seems to include a fairly large group of people, there’s no sign these black people are unwelcome in this space, nor should they be in such a multicultural part of town. Diversity did not stop there. Facing the viewer in the bottom-left foreground is a man exhibiting physical characteristics used to denote Jewishness in nineteenth-century caricature. His presence is a reminder that the capital was also home to two Jewish populations: Ashkenazi and Sephardic. He reminds us that London was not an exclusively Christian city in the early nineteenth century. Nor was it solely Church of England. In addition to the large group of Irish Catholics in the Rookery, the tiny parish of St Giles was home to a Sardinian Catholic Chapel, attached to the Sardinian Embassy, and a place for the city’s Italian population to come together and worship. Within minutes from where Tom and Jerry stood and just a few feet to the west of the parish boundary was the most French part of London – St Anne Soho, which was home to both French Catholics who had fled the French Revolution in the 1790s, and the descendants of the French Protestant Huguenots who had fled persecution almost exactly a century earlier, in 1685. One must wonder if any French voices echoed out among those cadgers in the room. If they had done, it certainly would not have been unusual. It’s a shame the figures in the painting cannot speak, for if they could, their voices would ring forth a chorus of accents from up and down the country, from Glasgow to Cornwall and everywhere in-between. London was a melting pot of English migrants who joined these strangers from further afield and came together on unfamiliar streets, where they built new relationships. Many of the British internal migrants passed through St Giles and its Rookery, adding their accents to the fray. ‘Lowest Life in London. Tom, Jerry and Logic among the unsophisticated Sons and Daughters of Nature at “All Max” in the East’ (1821), drawn and engraved by Isaac Robert Cruikshank and George Cruikshank (Public Domain, from the British Library collection). Diversity was of course not limited to St Giles. A few months earlier, Tom and Jerry had spent an evening in the city’s East End, at a popular working class dance hall. The scene is labelled ‘Lowest Life in London’, which acknowledges class and racial prejudices of the day, but also challenges those fears by depicting a joyful scene that showcases the coming together of cultures and a blending of classes. The wealthy Jerry cavorts with a well-travelled peg-legged sailor who plays a tune on his fiddle. A black woman in a colourful dress jigs with an Irishman, while a white person minds her on-looking baby. These imaginary images showcased some of London’s most diverse spaces in the early nineteenth century. In subterranean public houses, and dancing clubs on the edge of town, diversity was on the fringes. But, importantly, it was present. Faces of every shade, and accents of every pitch and timbre, rang through London. Windows into that lost world presented through the escapades of Tom and Jerry remind us of just how deeply embedded migration is in London’s history. It seems unlikely that London has ever been a white, Protestant, English city. Adam Crymble is a senior lecturer and historian of migration at the University of Hertfordshire. He is himself a migrant to London. The images discussed in this article were collected by his final year history students who contributed images of migration and diversity to an Instagram feed celebrating Britain’s diverse past. With special thanks to Ellen Daly for contributing the image of Tom and Jerry dancing at the ‘All Max’.